The Italian Greyhound is the smallest of the sighthounds, typically weighing about 8 to 18 lb (3.6 to 8.2 kg) and standing about 13 to 15 inches (33 to 38 cm) tall at the withers. Though they are in the "toy" group based on their weight, they are larger than other dogs in the category due to their slender bodies, so owners must be careful when sizing clothing or accommodations. The Italian Greyhound's chest is deep, with a tucked up abdomen, long slender legs and a long neck that tapers down to a small head. The face is long and pointed, like a full sized greyhound. Overall, they look like "miniature" Greyhounds. Though many Italian Greyhound owners dispute the use of the term "miniature Greyhound" in reference to the breed itself, by definition of the American Kennel Club they are true genetic greyhounds, with a bloodline extending back over 2,000 years. Their current small stature is a function of selective breeding. Their gait is distinctive and should be high stepping and free, rather like that of a horse. They are able to run at top speed with a double suspension gallop, and can achieve a top speed of up to 25 miles per hour (40 km/h). The color of the coat is a subject of much discussion. For The Kennel Club (UK), the American Kennel Club, and the Australian National Kennel Council, parti colored Italian Greyhounds are accepted, while the Fédération Cynologique Internationale standard for international shows allows white only on the chest and feet. The modern Italian Greyhound's appearance is a result of breeders throughout Europe, particularly Austrian, German, Italian, French and British, making great contributions to the forming of this breed. The Italian Greyhound should resemble a small Greyhound, or rather a Sloughi, though they are in appearance more elegant and graceful. 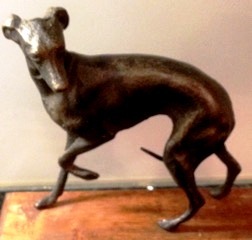 The Italian Greyhound makes a good companion dog and enjoys the company of people. However, the breed's slim build and short coat make them somewhat fragile, and injury can result from rough or careless play with children. The breed is good with the elderly or a couple without any children for it prefers a quiet household but they are also generally fine with older children. They also are equally at home in the city or the country, although they tend to do best in spacious areas. They are fast, agile and athletic. Like any dog, daily exercise is a must for a happier, well-adjusted pet. Italian greyhounds love to run. The young dog is often particularly active, and this high level of activity may lead them to attempt ill-advised feats of athleticism that can result in injury. Due to their size, and in some lineages poor bone density, they are prone to broken legs. Italian Greyhounds make reasonably good watchdogs, as they bark at unfamiliar sounds. They may also bark at passers-by and other animals. However, they should not be considered "true" guard dogs as they are often aloof with strangers and easily spooked to run. As gazehounds, Italian Greyhounds instinctively hunt by sight and have an extremely high predator drive. Owners of Italian Greyhounds should typically keep their dogs leashed at all times when not in an enclosed area to avoid the risk of even a well-behaved pet breaking away at high speed after a small animal. Like most sight hounds, because the Italian Greyhound's slender skull is near the same width as its neck, the use of a Martingale Collar is advised for walking. The collar tightens up when pulled while remaining comfortably slack when the dog is walking politely. This prevents the dog from backing out and escaping. Breakaway collars are advised for identification, because this active and acrobatic breed could easily injure themselves when put in a collar they cannot escape from, and this leads to possible neck injuries and strangling. Some Italian Greyhounds enjoy dog agility. The breed's lithe body and its love of action provide potential to do well at this sport, although not many Italian Greyhounds participate, and their natural inclination is for straight-out racing rather than for working tightly as a team with a handler on a technical course. Lure coursing is another activity well-fitted to the Italian Greyhound, and they seem to enjoy it tremendously. Although the Italian Greyhound is a very fast dog, it is not as well suited to racing as its larger cousin. Regardless, many Italian Greyhounds participate in amateur straight-track and oval-track racing. Dogs of this breed have an extremely short and almost odorless coat that requires little more than an occasional bath about once a month (though many veterinarians suggest that even bathing one per month is too frequent for this breed), but a wipe-down with a damp cloth is recommended after walks as seeds, burrs and floating dust in the air can get into the coat and irritate the skin. This breed sheds medium to little hair. The teeth of an Italian Greyhound should be brushed daily. Their scissor-bite and thin jaw bones make them susceptible to periodontal disease, which can be avoided with good dental care. Daily brushing has been shown to be very beneficial as well as regular dental cleanings from the vet.